These customizable prints on wood panel capture all of the layers of the original. Plus you can add your own word, phrase, dates and names. 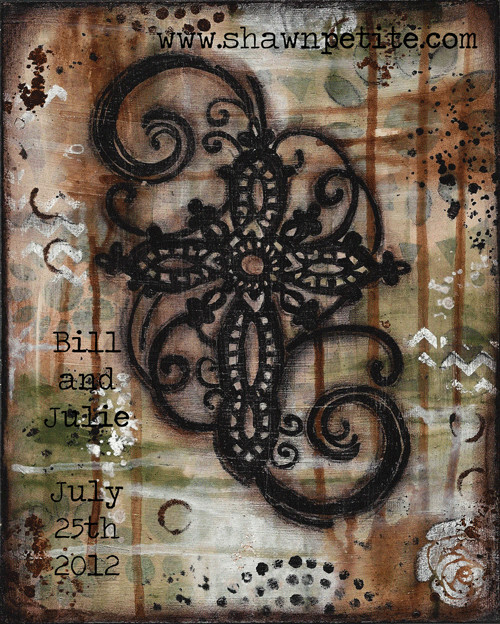 These are perfect for that one of a kind gifts for weddings, baby, baptism, anniversary or special occasion. On the order form there is a comment section. you can place your word, phrase or names and dates and I will respond withing 24 hrs (usually sooner) with 3 font options and placement and get your approval. Once approval is made I will put your piece together in the same quality as all of my pieces. Sides and back will be painted black, signed and ready to hang. Delivery time for a custom piece is 10 business days and then 3 days shipping. colors may vary slightly due to monitors. All artwork copyright Shawn Petite LLC.